Online marketing does not have to be expensive. First of all, the internet has made it more affordable for everyone to market their business. Before, only big companies can afford to advertise. Due to the leveling field of the internet, today, even small businesses can afford to purchase advertisement slots online. But truth to be told, many online marketing strategies are expensive when you look at it from a long-term perspective. There are many things to consider when choosing the best advertising option for you; however, it can be difficult to sift through the wide array of choices online. There are red flags that you should be cautious about when choosing the best advertising tool for your business. You must be ready to sift through the real and bogus online marketing tactics that may either increase or undermine your success. Being affordable does not have to have bad quality, in much the same way as being expensive is expected to offer the best service. The price should not dictate how you expect each marketing service’s quality, and the most efficient way to decide which set of strategies is best for you is through trial and error. Before you delve into online marketing tactics, understand that it is time-consuming to do and takes a lot of effort and patience. You cannot expect to apply the marketing strategies and then have impressive results straight away. You must wait patiently and proactively keep on updating your marketing tactics. That is the beauty with SEO. Although it does not have to cost much, smartly doing it is the most cost-effective strategy to do it. Social media has quickly moved from being just a way to connect with friends, to now one of the favorite channels of both businesses and consumers to reach out to each other. The top social media sites include Facebook, Instagram, Twitter, YouTube, Pinterest, and Tumblr. If you can push through with putting on creative and memorable ways to market your brand, then for sure you will expect people to take notice of you. But you can’t do your marketing sporadically. 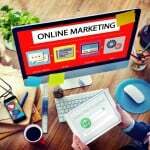 You must be proactive in seeking marketing opportunities for your company, so make the most of these free tools available online. Many small to large enterprises now use social media to boost their ratings. They also now use social media as a customer service support outlet where they can connect with current and potential clients. Social media can do wonders for your brand, so make the most of this free marketing tool. Having a mobile-friendly website has once been an option; however, these days, it is mandatory for you to customize a site just for mobile use. It is because more people are now using their phones instead of their desktops to check websites. If you choose not to have a mobile-friendly option, you are undermining your success because you are shooing people away as soon as they see a hard-to-navigate website. And no one wants to view a desktop-ready site on a smartphone. It can be difficult to read and confusing to use. These tips may sound basic, but you will be surprised to find that many entrepreneurs overlook them thinking that they are not important. Having well-updated social media channels and a sleek mobile site are crucial elements to helping your business succeed. You may want to look into them and put in all the effort to improve on these two factors. Another one is marketing automation. We’ve recently started using it with marketing automation. Are you looking to showcase your writing skills? We’re looking for SEO/Marketing writers who are interested in contributing to our blog.